You need your wok to be absurdly hot. Alternatively, you could use a saute pan, but in both cases, they need to be as hot as possible. When you don’t have high enough heat, you won’t achieve satisfactory results. Sometimes a blast of the highest heat setting for five or ten minutes will be long enough. However, you need to make sure that the cooking wok is empty. Once it’s hot enough, you’ll need to add the cooking oil carefully. 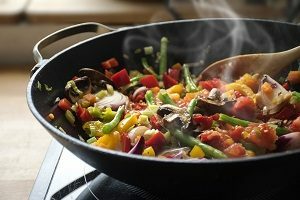 Vegetable oil is best for cooking the perfect stir fry. Then you can start adding the vegetables. When you are ready to throw the meat portion into the stir fry, just remember two things. First, you can’t add it when it is still cold. You’ll need to that it first, so give it twenty minutes to rest on the counter and approach room temperature. Marinating the meat can happen at this stage. Some meat is marketed as meat specifically for stir fry, but you’d prefer fresher meat, you can slice your own instead. Lastly, it’s time to combine all of the ingredients. You’ll need to add meat last once it’s ready to go. You can only cook eight ounces of meat at a time, or else the meat won’t be as flavorful. So if you have more than eight ounces, it’s best to split them up and go one at a time. Don’t overcook the meat, because it will finish when the meat is re-added on top of the vegetables. Use a blend of cornstarch and cold water to help the sauce thicken a little bit. Then once it’s almost ready, add a dash of sesame oil on top. You now have the perfect stir fry! This entry was posted on Friday, March 16th, 2018 at 12:20 pm . You can follow any responses to this entry through the RSS 2.0 feed. Both comments and pings are currently closed.